Janine’s been a Latics instructor since 2008 and her love for the job shows! She has such a great easy going attitude which will help you relax into your driving while making your lessons both enjoyable and fun! Items I can’t live without: Teapot and tea cosy! 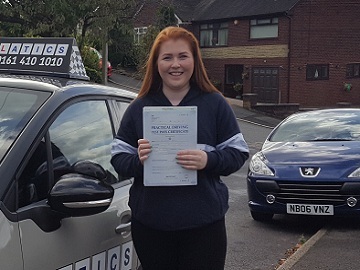 Janine gives driving lessons in Saddleworth, Delph, Denshaw, Diggle, Dobcross, Grasscroft, Greenfield, , Scouthead, Sholver, Springhead, Uppermill, Waterhead, Watersheddings, Ashton-under-Lyne, Austerlands, Bardsley, Carrbrook, Chadderton, Derker, Droylsden, Dukinfield, Failsworth, Fitton Hill, Greenacres, Hathershaw, Lees, Moorside, Mossley, Oldham and Royton. Janine is an absolutely fantastic instructor. I want to start with saying that without Janine, I would never have passed my test. Janine is the Driving Instructor that everyone should wish to have! Great pass Dan 1 fault! Fantastic Tom 1st time pass! Fab 1st time pass 3 faults! 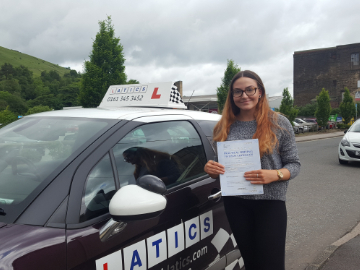 Fantastic 1st time pass Zero faults! Great 1st time pass 1 fault! 1st time pass 1 fault! Start learning to drive today! Copyright 2001-2018, Latics Driving Training Ltd.